Anointing of the Sick is one of the two Sacraments of Healing; the other is Reconciliation. The Anointing is a powerful and effective sign of Jesus’ presence that brings strength and healing to the sick, the elderly, and the dying. The celebration of this sacrament can help the sick get well again. When that does not happen, the sacrament helps the sick face their illness with faith and trust. It also helps dying people continue their faith journey to God in heaven. Any illness of serious nature can be a legitimate reason to celebrate the sacrament. 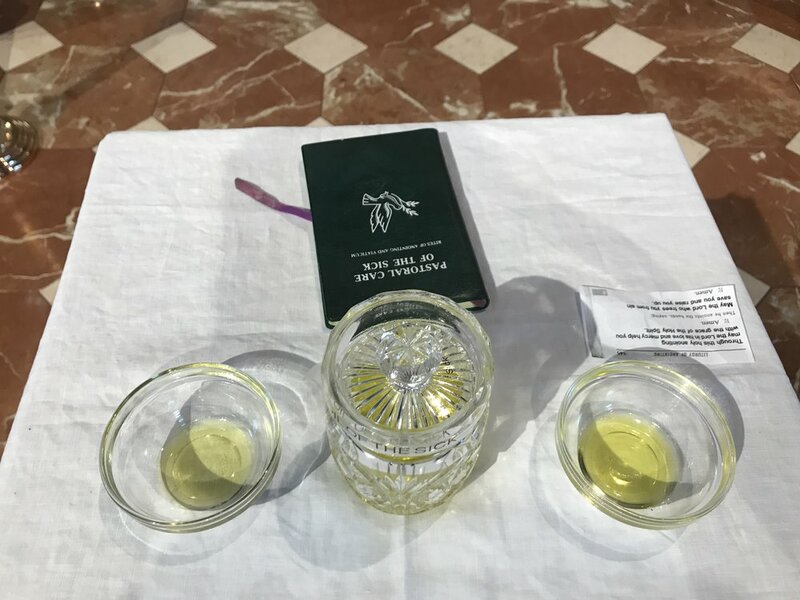 The sacrament may be repeated if the sick person recovers after the anointing but becomes ill once again, or if, during the same illness, the person’s condition becomes more serious. Any person preparing for surgery is encouraged to contact our pastor to receive the sacrament. If you are scheduled for surgery and would like to receive Anointing of the Sick, please contact the parish office as soon as you know the date of admittance. The sacrament can be celebrated prior to admittance or once you are in the hospital. If you are homebound or in a healthcare facility (either permanently or temporarily), please contact the parish office as soon as possible. If you are not able to inform the parish yourself, please ask a member of your immediate family to do so on your behalf. When you contact the office, you might also want to consider requesting Communion, Confession, or pastoral visits as well. If you need to request Anointing of the Sick or have further questions, please contact our parish office.